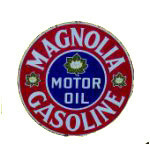 This simple white sign advertises Gulfpride Motor Oil. The sign is square with a blue border. 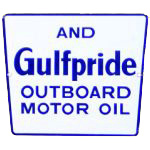 The text reads “And / Gulfpride / Outboard / Motor Oil” in blue text.